I love pasta in every shape and form: bow tie, elbow, shells, ravioli, manicotti…you name it! If it’s carb-filled and covered in sauce, I don’t discriminate! However, let’s be honest, pasta once in a while is ok but it’s probably not the best dinner option for bikini season. 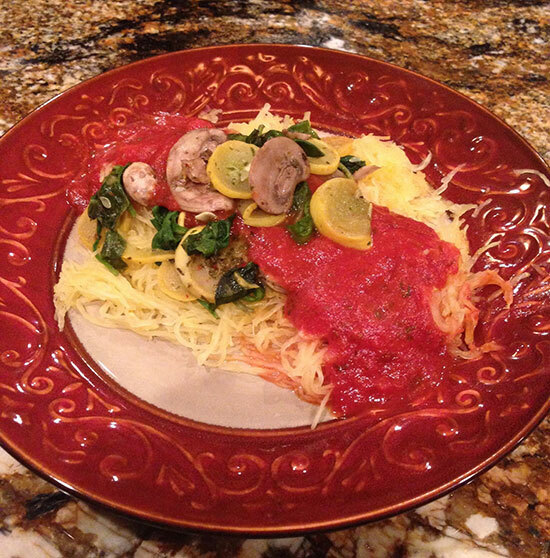 Therefore, I decided to try to make spaghetti squash as my pasta substitute and I must say I was pleasantly surprised! Now, I’m not going to go as far as to say it tasted just like real pasta, because nothing tastes that good, but it was an excellent alternative that I really enjoyed and will make again! 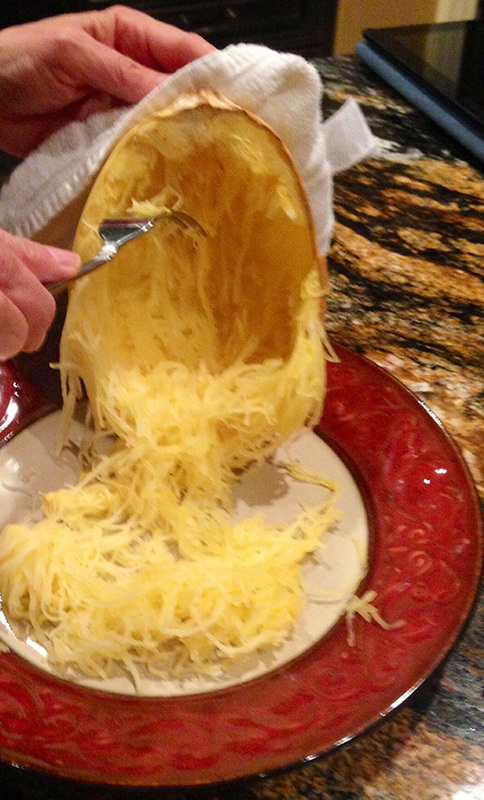 First, get a medium spaghetti squash and cut it long ways and then scoop out the seeds. Next, brush it with a little bit of olive oil and season it with sea salt and pepper. 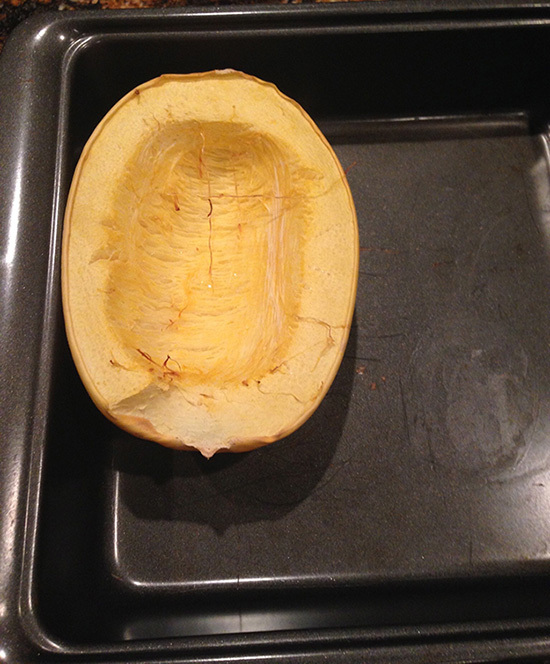 In a 375 degree, pre-heated oven, place your squash in a roasting pan and cook for 50 minutes. You will know it’s done when you can poke it with a fork easily. 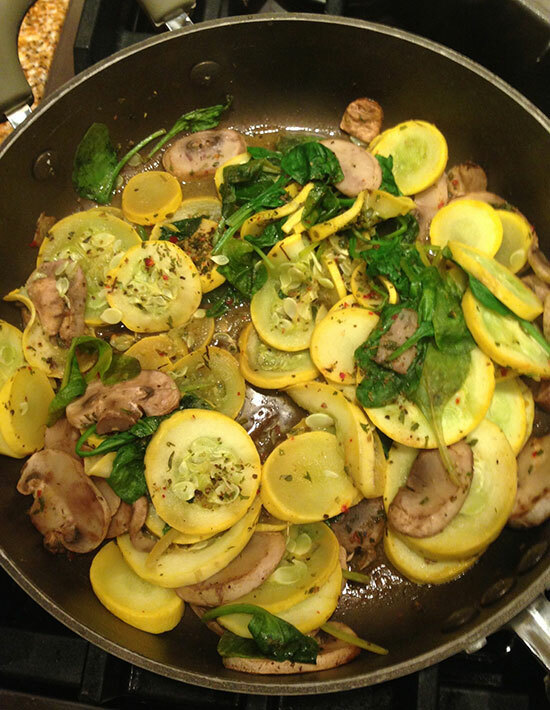 While that was baking, I decided to go on vegetable overload for dinner and took fresh mushrooms, spinach and yellow squash, chopped them all up and sautéed them in a little bit of olive oil, red pepper flakes, pepper, sea salt, and Italian seasoning. Next, I made a sauce. (Sorry, that one is my Nonnie’s secret!) Make your family favorite sauce or, hey, open up a jar of it and heat it up…we all know life is busy! 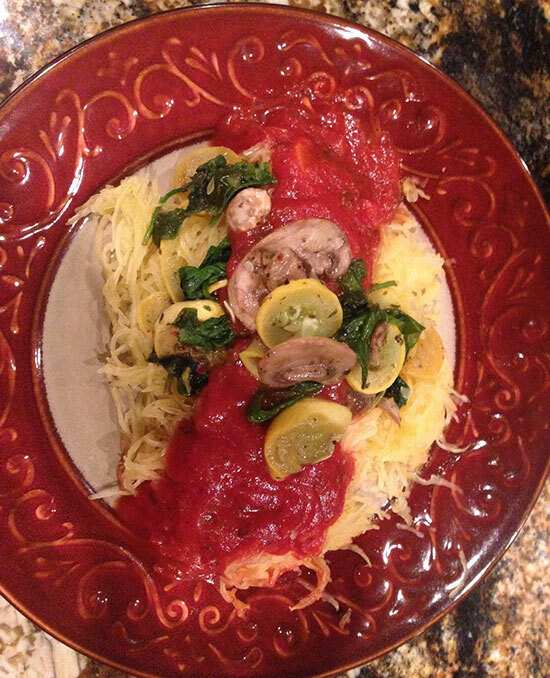 Once the spaghetti squash is all the way cooked, take it out and let it cool for a few minutes until you can touch it or, as you can see in the photo, use a towel to hold it. All you have to do is, starting at the top, drag a fork down and it will separate like spaghetti. After that, simply top with your sauce and then vegetables, add a little bit of parmesan cheese, if you would like, and enjoy your super healthy dinner!